1. The shirtless guy – In this scenario, the shirtless guy just happens to be me. I have always believed in the quote “A man who follows a crowd will never be followed by a crowd” and that is how I have operated most of my life. In 2010 when I began getting more serious about doing food challenges and getting into competitive eating, I quickly realized that I didn’t really believe in any of the current organizations and how they operated. If I don’t believe in the company I am working for, the team I am working with, or the boss that I am working under, I don’t work very hard at all to make them money, and that is why I have been fired from or quit most of the jobs that I have ever had. With that being said though, I am completely “all-in” if I believe in something and there is no such thing as giving 50% effort. Therefore, I began doing “my own thing” and started focusing on learning about and promoting food challenges which nobody else was really doing at the time. Everyone else was much more focused on competitive eating contests. As I continued, I gained a “bigger picture” that I started working towards, and that is why I created RandySantel.com. Once that website was up and running, I developed an even larger & global dream, and that is FoodChallenges.com. I have been “dancing” since 2010, “all-in” since 2013, & I am extremely determined to get the “movement” started and going strong all around the USA and world. 2. The first follower – In this case, the first follower is “Magic Mitch” Dombrowski, who started “dancing” with me back in March 2013. He has produced every video for us since then and he is doing a phenomenal job. He has been “all-in” with me since 2013, and Mitch is also fully committed to getting the “movement” started too. 3. The second follower – We are still waiting for this person to join Team #FeedTheMovement. We are promoting over 3000 food challenges in over 22 countries, and our website will be seen in over 30 countries. What we are looking to do is way too much work for Mitch and I to do alone, but we are going to keep plugging away until the qualified 3rd member joins the team. The initial responsibilities of the second follower will be taking care of our store and apparel along with helping with social media and the website. We have 3 very lucrative shirt ideas and 1 extremely lucrative one, but we need somebody to sell them while I take care of the site content and Mitch takes care of videos. We will all work together to set up events and do everything else. Once the second follower joins our team, we will be full speed ahead and start really gaining momentum. Will that 2nd follower be you? 4. The next few initial followers – Once Mitch, the 2nd follower, and I are functioning at full strength, people will start getting more involved with the website and purchasing apparel so that they can represent and support the FoodChallenges.com brand that we have built. More people will start doing more challenges, more restaurants will create food challenges, and more businesses will start hosting contests. Once we get to that point, things will really take off and the community will begin to grow and spread like a forest fire. Did you notice the crowd once more and more people started joining? All of the people turned their heads to see what was going on!! As more and more eaters and people join in, more and more people will become interested in seeing what all the fun is about. That tipping point is when we will start rapidly expanding and really gain an unstoppable momentum. 5. When everyone else starts joining in – Competitive eating right now is treated as more of a circus event than a serious sport, and therefore not many people are really interested in participating or following our community. People don’t want to risk being different than everyone else, and therefore they follow the more mainstream & generally accepted sports that are available, depending on the season. Once we get to the point where our community is growing by “leaps & bounds” each and every day to the point where we are constantly getting new members and finding out about more and more challenges & competitions, that is when the public view of our sport will really begin to change. There will be a lot more news articles and stories published, there will be a lot more social media activity related to competitive eating, and it will be covered a lot more by radio and news shows. Our sport will finally be “accepted” and mainstream. The organizations still functioning like it is the 1990’s will be completely left behind, and the future opportunities for everyone remaining will be endless. 6. Uniting the different countries – We are adapting some of our strategies from the book The Art Of War by Sun Tzu in regards to uniting all of the eaters in all of the different countries around the world with eating competitions. The “movement” will not only be centralized in the USA, or just in England, or just in Australia. It will be everywhere!! We will be helping to set up sponsored athletes in all of the major countries who will basically #FeedTheMovement throughout their own particular country. Because we will be in so many countries, we will be able to attract BIG sponsors that are involved in all of the different countries. Major sponsors mean major opportunities and events which also means that eaters can potentially earn more than a few hundred bucks at a time per event. Next time you have a few minutes, check out different stories about poker and mixed martial arts. Those activities are so big because they unite all of the different people from around the world. We are going to do that too through events such as the World Eating Olympics, World Food Challenge Day, and creating a legitimate competitive eating related television series, plus a lot more will happen as we grow!! 7. Opportunities will be endless – Once the public opinion regarding competitive eating has changed, restaurant owners and other businesses will stop being so hesitant to promote eating competitions. Many restaurants with food challenges don’t really promote their challenge at all anymore, mostly because they aren’t sure that promoting it will actually work. Some people think Man v Food started a “phase” for a while and now that phase is about over. They will change their minds once everyone is talking about competitive eating again, and they will then want to be part of all the fun, because these businesses with challenges will be getting many benefits too. Once restaurants are really promoting their challenges and more businesses are hosting contests at big festivals and other events, there will be constantly be events available to compete in for all of our eaters. Because their will be competition, businesses will have to put up larger prizes to attract the better eaters. FoodChallenges.com will sponsor and host events too in different countries that people will be able to compete in. Because we will have a large following and we will video all of our events to provide further advertising, and because we will be working with TV networks by then, our contests will involve larger prizes for eaters to earn. The first place prizes today will be 3rd & 4th place prizes when we really have the “movement” going. We could go on an on about different possibilities. None of these opportunities will happen though if we all don’t start working together NOW so that we can build a strong united following that can be leveraged when contacting businesses. We will be fighting uphill in the beginning, but it will be all downhill once we reach our tipping point. The “movement” is not to help just a few people. Everyone will benefit and that is why we need help!! 8. When will you join the movement? – Whether it takes 2 months, 2 years, or 2 decades, WE WILL BE VERY SUCCESSFUL. The movement is going to happen, and it will not be stopped, simply because our core group of people involved are extremely dedicated to making it happen. The real question is when will you join the party and #FeedTheMovement too? Do you want to be one of the first people that has the most fun or do you want to be like the lady at the end saying “How did he do that?” Please don’t think you are following me either. This is not a church and I am not a pastor. I am just the first and only person that I know of who really believes that competitive eating can be a lot more than it currently is now. Wishing for change won’t help much, but let’s all work together as a team to make the change happen. There is no question about HOW or IF it will happen. The question is when will our tipping point come? With your help, that point will come much sooner than later. 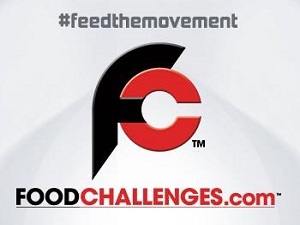 Thanks for reading “How #FeedTheMovement Will Actually Work” and using FoodChallenges.com! !